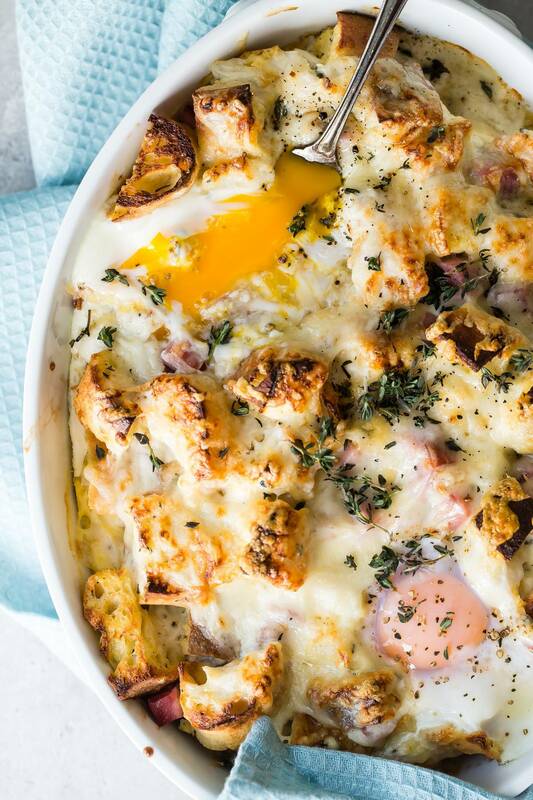 Breakfast and brunch will never be the same after eating this Croque Madame Breakfast Casserole recipe. 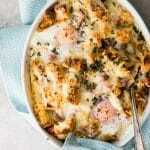 All the flavors of the classic French sandwich in casserole form! One of my favorite sandwiches ever is the Croque Madame. If you haven’t tried one and you like sandwiches it’s definitely one to add to your list! It begins with a slice of thick country french bread, then a layer of grated Gruyere cheese, a slice of smoked ham. Place the other slice of bread on top, cook it like grilled cheese and of course, add an egg on top. There’s also a Croque Monsieur which is basically the same sandwich but without the egg (which is always a must for me). The whole sandwich is then lightly covered in a creamy bechamel sauce and broiled for a hot second with more cheese. As if all that doesn’t sound delicious and outrageous enough, a soft fried egg is placed on top, and now you can dig in. It’s definitely something for a lazy Sunday brunch, the only downside being you can’t really make it ahead of time and it doesn’t really do well for feeding a bunch of people. That’s where I came up with the idea of stuffing all of the flavors and ingredients of the Croque Madame into an easy breakfast casserole. How to make your Croque Madame breakfast casserole. 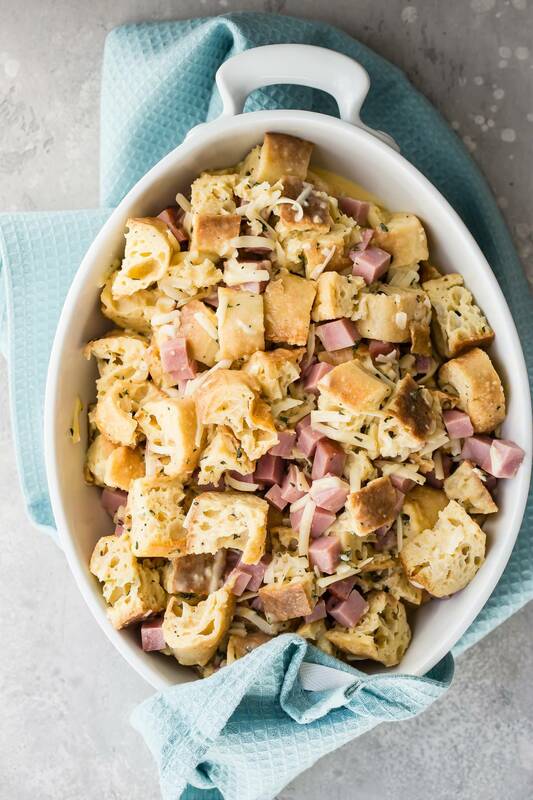 Breakfast casseroles, strata, and bread puddings all have one thing in common and that’s the addition of eggs. The eggs become an important binder for the rest of the ingredients so it makes sense that if one ingredient is making up a big part of the recipe, then it should be high quality and taste amazing! Pete and Gerry’s Organic Eggs easily fall into that category being organic and free range, they really do shine above all other eggs. Try comparing a Pete and Gerry’s egg yolk to a regular egg yolk and you’ll see and taste a big difference! Every Pete and Gerry’s egg comes from small family-owned farms where love and passion towards their product is an everyday occurrence. This breakfast casserole recipe begins like a bread pudding. The bread chunks are mixed with the rest of the ingredients and then left to rest. This important step lets the bread soak up the egg making for a moister final dish. The bread has to be hearty and rustic so don’t use regular sliced bread. It’s too thin and will just dissolve when mixed with the egg mixture. Look for an unsliced crusty french style or sourdough and cut it yourself into thick cubes. Why is this breakfast casserole recipe any different from other casseroles? 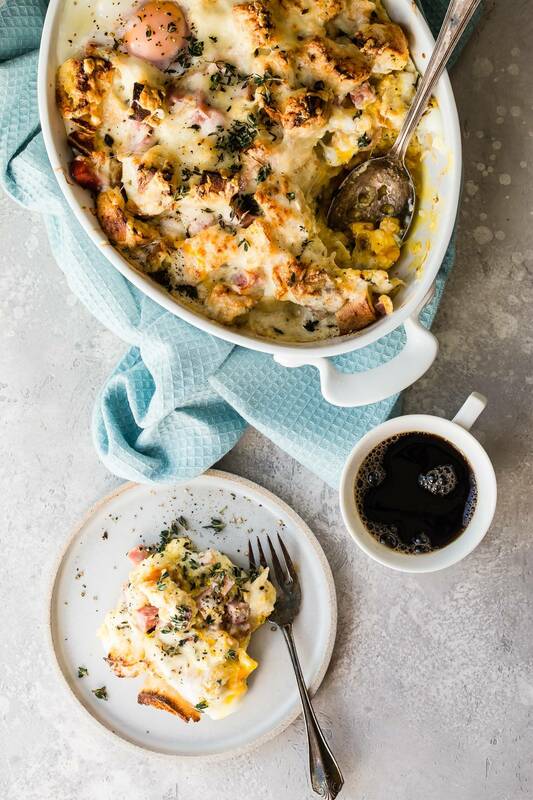 Regular casseroles lack a creamy interior, they’re firmer due to the egg cooking but because this breakfast casserole recipe has the extra layer of bechamel sauce it becomes really creamy as it cooks. It is a Croque Madame after all so by adding a few more eggs to the top of the casserole and lightly broiling them just enough to cook the whites, the casserole becomes even more delicious with the extra yolk mixing with the bechamel and melted Gruyere cheese! Fresh thyme and black pepper sprinkled on top make this a serious brunch winner. It’s a tiny bit more work to make it but well worth it. Can I substitute the cheese for another kind? Gruyere has a unique nutty taste which goes along with eggs and crusty bread so well together. But if you just can’t do Gruyere, then Swiss cheese, Gouda or a mixture of Parmesan and Romano would work. Can I reheat the breakfast casserole? I recommend covering it with foil and reheating it in the oven at 400 degrees. If time is not on your side, then a minute or two in the microwave will also work. Don’t forget to tag me @foodnessgracious if you make this delicious recipe or any other recipe! I love seeing what everyone is making. 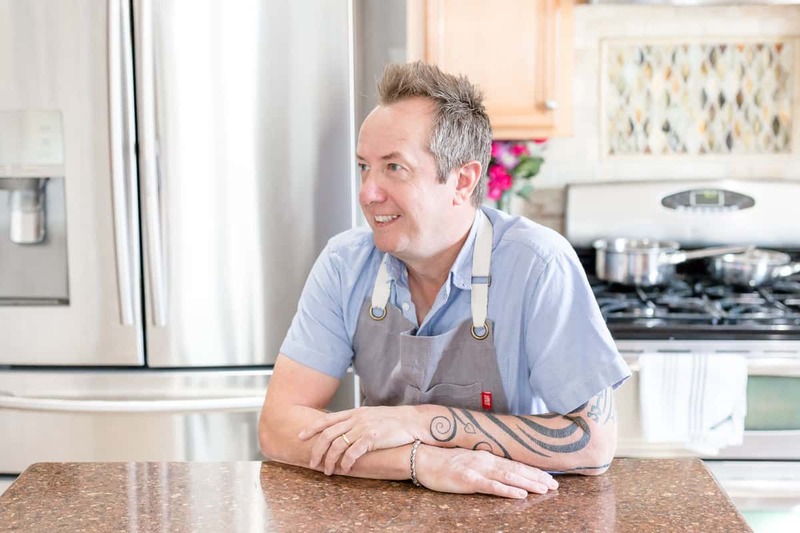 You can follow me on Instagram, Facebook, and Pinterest so that you’ll never miss my latest posts! 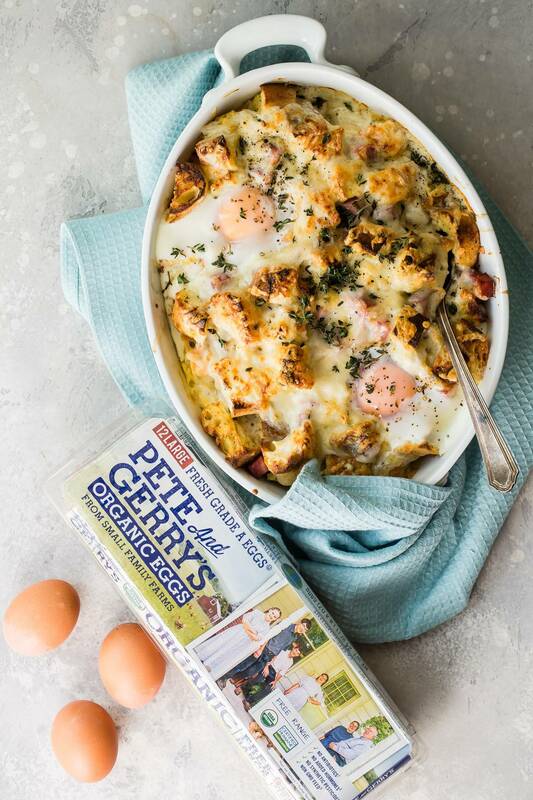 Pete and Gerry’s Organic Eggs can be found in lots of places, but this handy store locator will take you right there, easy! 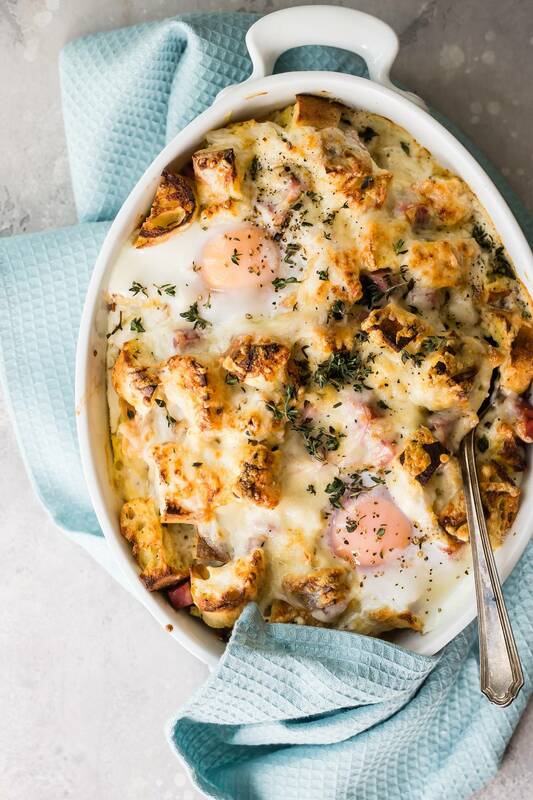 This is the ultimate breakfast or brunch casserole based on the amazing Croque Madame sandwich. Now you can have all the deliciousness of the classic sandwich in casserole form! This breakfast casserole recipe is a keeper! In a large bowl, whisk together the eggs, milk, half and half, thyme, salt and pepper. Add the bread to the egg mixture along with the grated cheese and diced ham. Using your hands or a spatula, mix the ingredients well making sure the bread has been well soaked in egg. Transfer the whole mixture from the bowl to a 2-quart oven-safe dish and spread out evenly. Cover with foil and bake in the oven for 30 minutes. While the casserole is baking, make the béchamel sauce by melting the butter in a non stick pan. Add the flour and whisk together for 2-3 minutes. Gradually add 1 1/4 cups of the milk, whisking constantly over medium heat to get rid of any lumps. Save a quarter cup of the milk for later. The sauce will thicken as it cools and that’s okay. Add the nutmeg when the sauce is smooth. Remove the sauce from the heat and set aside until the casserole is done. Once the casserole is done, take the foil off. Turn the oven up to 425 degrees F.
Bring the béchamel sauce back to the burner and place on low heat. Whisk the remaining quarter cup of milk into it until it’s smooth again. Pour the béchamel sauce over the casserole and then top with the remaining 1 1/2 cups grated Gruyere. Place back into the oven and bake for a further 8 minutes uncovered. Take the casserole from the oven and carefully create two slightly sunken holes with the back of a spoon. Crack an egg into both holes and place back into the oven or under the broiler until the egg whites are firm. Sprinkle with extra fresh thyme and serve alongside a hot cup of coffee.